Gastro esophageal reflux disease (GERD) – also known as acid reflux. In this disease, stomach contents come back up into the esophagus. This leads to a complication like esophagitis. The cause of GERD is complex. It may damage the lining of the esophagus. Rabeprazole sodium to reduce stomach acid and treats GERD, duodenal ulcers. How does Rabeprazole sodium work? Rabeprazole belongs to the class of drugs called proton pump inhibitors (PPIs). The drug acts by permanently inhibiting the proton pumps in the stomach. They are anti – secretary compounds. The drug selectively and permanently binds to and inhibits the H+, K+, and ATPase enzyme. This inhibits gastric acid secretion. It blocks the final step of gastric acid secretion. Low secretion of gastric acid help to heal symptoms of heartburn and other related problems. How to Take Rabeprazole Sodium? Rabeprazole sodium is available in the form of pills. The strength is 10 mg and 20 mg. The dose depends on age and condition that is treated. The length of treatment is different for different patients. The action starts within an hour. Take it 30 minutes before your first meal or breakfast. Usual dose – 20 mg one time in a day. Maximum dose – 40 mg in a day for 4 to 8 weeks. Below 15 kg -5 mg in a day for 12 weeks. Infants (0-12 months) – safety and efficacy not established. What are the uses of Rabeprazole sodium? 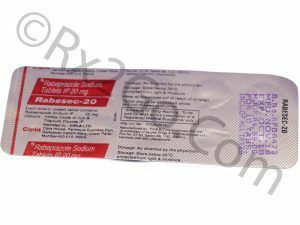 Rabeprazole sodium is helpful to treat following conditions. Heartburn caused due to GERD. Acid-related damage to the lining of the esophagus. Zollinger – Ellison syndrome (too much production of stomach acid). Heal and prevent stomach and gut problems due to too much stomach acid. Your doctor may prescribe it to treat a medical condition not listed in above list. What are the precautions in taking Rabeprazole sodium? Allergic to above drug or other PPIs. It may cause diarrhea, in some cases, it can be severe. Long time use of the drug can increase the risk of having fractures. Generic medicines are cheaper and very same as the brand ones. They don’t include expenditures like research and development. Other costs like packaging, pricing, and advertising too increase the price of the drug. Above drug is a cheap drug with the same effect as the brand ones. Cost of Generic Rabeprazole sodium. Pack of 30 pills 10 mg costs $ 9, per unit cost is $ 0.3. Pack of 30 pills 20 mg costs $ 10, per unit cost is $ 0.33. Pack of 30 pills of 20 mg costs $ 360.29, per unit cost is $ 12.01.